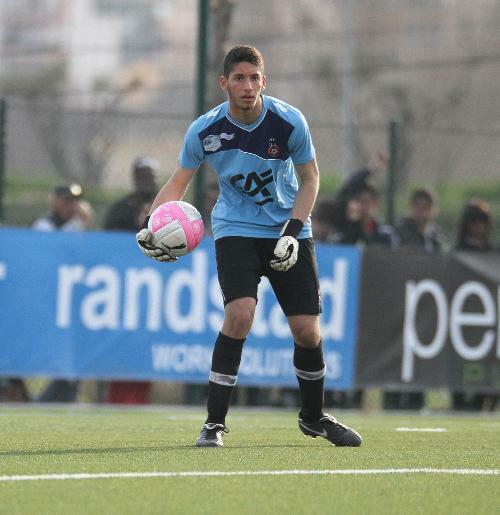 Home › Analysis › Mouez Hassen, Goalkeeper: Don’t Forget This Name ! 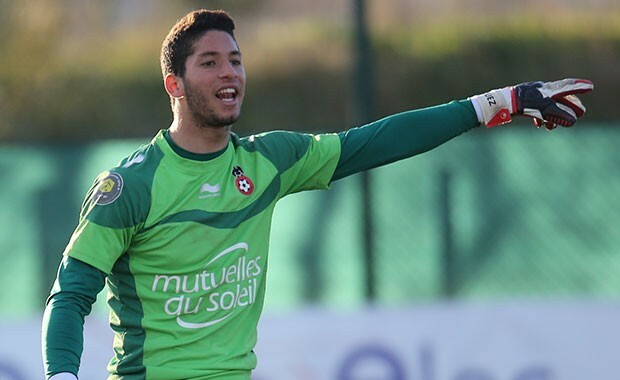 Hear, Hear, there’s a newcomer in Ligue’s 1 Player’s list; a 19 year-old Frejus(South France) native, OGC Nice’s number one goalkeeper, Mouez Hassen, rumored to be the next French world-class goalkeeper just like his predecessor between the sticks, Hugo Lloris. There are lots of similarities between the current and the former “Aiglon”: both Nice’s Youth Academy students, both first A team choice goalees at nineteen, both excellent in France’s national teams(U-16 U-17 U-18 U-19) and proud Winners of the Cambardella Cup, the Holy Graal for each young French player. There’s one difference, though; Mouez’s start as a goalkeeper, was a late one. He was thirteen when he put on the gloves for the first time. Like Lloris, Hassen is quite slender,(1.84m / 70 Kilos) but that doesn’t bother him, for his slender frame allows him to keep his speed, one of his major qualities. He’s also very vocal and bosses well his defenders. He’s certainly not the most famous or the best goalstopper of Ligue 1 but since he officiates between the sticks, parrying Joris Delle’s injury, Nice’s doing all right; 11 points taken from 15 possible, and their last game Away at Lille 0-0 is a good omen for the young player. The young man, watches often former Aiglons’ Lloris (Tottenham Hotspur GK) and D’Ospina ( Arsenal GK) videos, to learn some tricks of their trade; he even watched the North London’s Derby and was very much impressed by their talent and game quality. Hassen, is a nineteen year old professional player, but his life is like any other teenager’s; playstation, wi-fi, mates, but first of all, Football ! He’s a hard working lad and that’s why he’s called to join France’s Under-21. Also, having started 21 times in Ligue 1 made him the youngest goalkeeper in the five more important European Championships. Will he be better than the former duo of world-class goalies ? Don’t Forget This Name ! Here’s some of his highlights, have a look. ‹ Nasri hits out at Deschamps and Lloris: Methinks, the Lady protests TOO MUCH !